Alden took on the role of renowned screenwriter, Boni Ilagan. 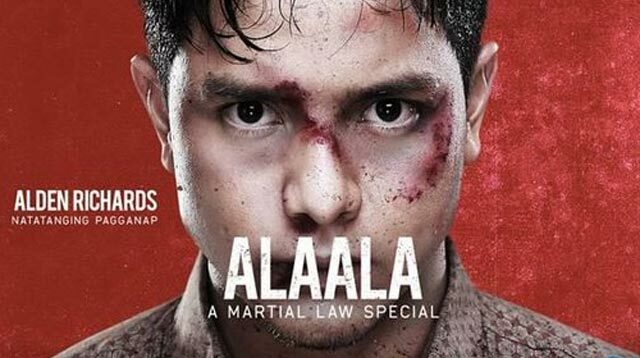 On Sunday September 17, in commemoration of the 45th year since the declaration of Martial Law, social media raved about Alden Richards' extraordinary portrayal of activist and screenwriter, Bonifacio Ilagan in Alaala, a GMA Network special documentary featuring the plight of young Filipinos fighting to regain freedom from the hands of dictatorship. The recollections of torture and struggles during the dark times of the Martial Law era—written for the screen by the award-winning writer himself—were brought to life by Alden, together with another Kapuso actor Rocco Nacino, who took on the role of activist and writer, Pete Lacaba. In an interview, Boni Ilagan detailed his experience of writing the script,"Kahit kaming magkakasama, hindi kami nagkukwento ng mga dinanas ng bawat isa—of course, there are bits and pieces. Pero para detalyihin, mahirap. Kasi it is like reliving the trauma. And the trauma was really unimaginable." "Physically, psychologically, emotionally, mentally—mahirap 'yung role. I've never been tortured in any of my roles when I was doing projects with soaps and movies," Alden shared about his acting experience. "Babasahin ko 'yung eksena, pero I forget about it. I just memorize the lines kasi maganda yung sinu-surprise mo yung sarili mo as the scene unfolds every second," he added. Alden's performance on the News and Public Affairs presentation trended on social media (#AldenOnAlaala), not only for the topic's relevance, but because of Alden's maturity in tackling the role of a Martial Law survivor.